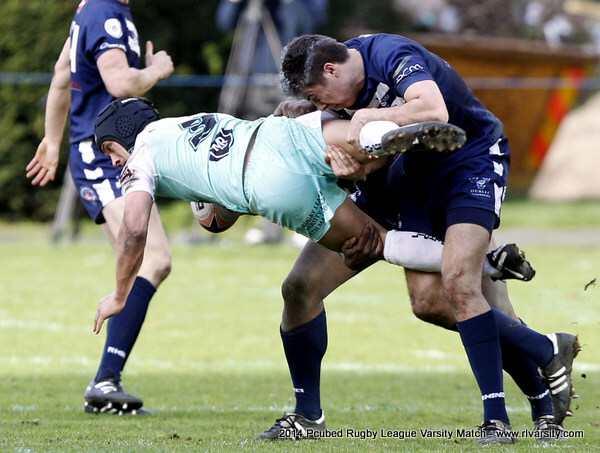 Oxford went ahead in the Rugby League Varsity March series with a convincing victory, equalling Cambridge’s record of five successive wins in the 1990s. The Dark Blues were always in control and despite some periods of dogged defence by their opponents, never looked like losing. Oxford opened the scoring after four minutes when a strong run by Oakley Cox down the left saw the winger touchdown. Jake Whittaker converted and was again on target minutes later when they forced a goal line drop out and George Sismey-Durrant took a pass from Jack Barber to score. Cambridge launched their first real attack after 14 minutes but despite forcing a goal line drop out themselves and then being awarded a penalty, could not turn the pressure into points. Oxford had been repeatedly warned about their tackling technique and when Ben Claxton put in a shoulder charge, the referee had had enough and sent him to the sin bin. The Light Blues still couldn’t take advantage and just before Claxton’s return Oxford increased their lead when Marcus-Alexander Neil, a hard working second row, crossed. Whittaker again added the extras to make it 18-0 at the break. There was more steel in the Cambridge tackling after the interval and for the first 20 minutes the game developed into a midfield battle but going into the final quarter Oxford moved further ahead. Winning a scrum in a good attacking position they moved the ball smartly to the left where Cox forced his way over in the corner for his second try. Whittaker was unable to convert but was soon back on target when the scrum-half put Neil over for his second try. Cambridge briefly threatened to open their account when a couple of strong runs saw centre David Sparkhall go close but Oxford finished strongly. Powerful bursts from Abeku Nelson down the right created opportunities for winger Joe Davies to touchdown twice with Whittaker rounding off a fine performance by converting both. He was later named as man of the match and awarded the Bob Mahuta Trophy.